My husband and I love to go on a food trip. You guessed it right, our favorite past time is eating. The other day, we were at Festival Supermall to try out Jack’s Loft. We were surprised to note that Jack’s Loft, My Thai and Phoa shared a common dining area. 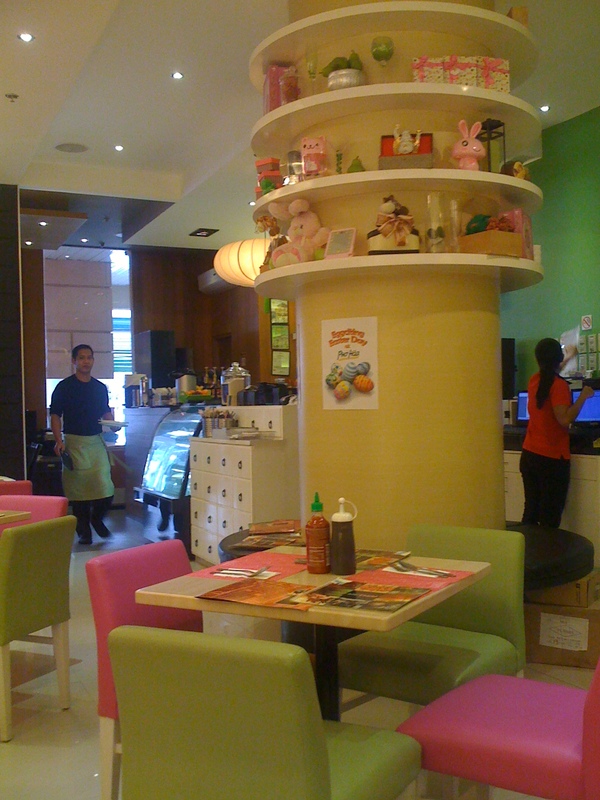 We opted to be seated at the My Thai/Phoa area since it has a more vibrant feel than the Jack’s Loft corner. I was immediately attracted to the pink and green chairs. I just love how pretty the place looks like. One side of the wall is decorated with drawers and there are two fab white couches against it. 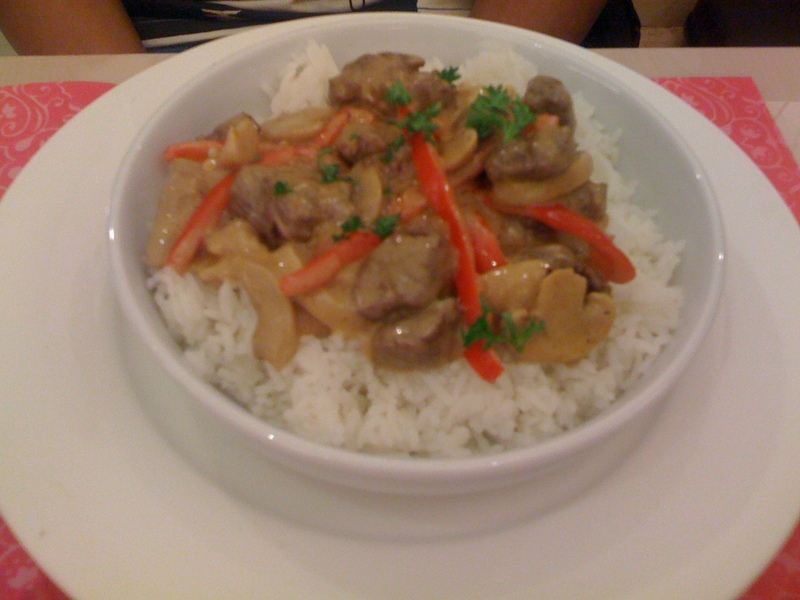 Since we were not up for some Thai and Chinese food, we ordered two main dishes from Jack’s Loft as originally planned. My husband had the Beef Tenderloin Stroganoff. This is beef tenderloin sauteed in mushrooms and red pepper, and topped with stroganoff sauce. The beef is chewy and tasty. I love the stroganoff sauce, it taste heavenly. I am a sucker for creamy sauces on top so this dish definitely goes well with my palate. They had medium size serving for this one though so it is good for one person only, if you opt to share with someone, it will be bitin. I had the HK Style Baked Pork Chops. 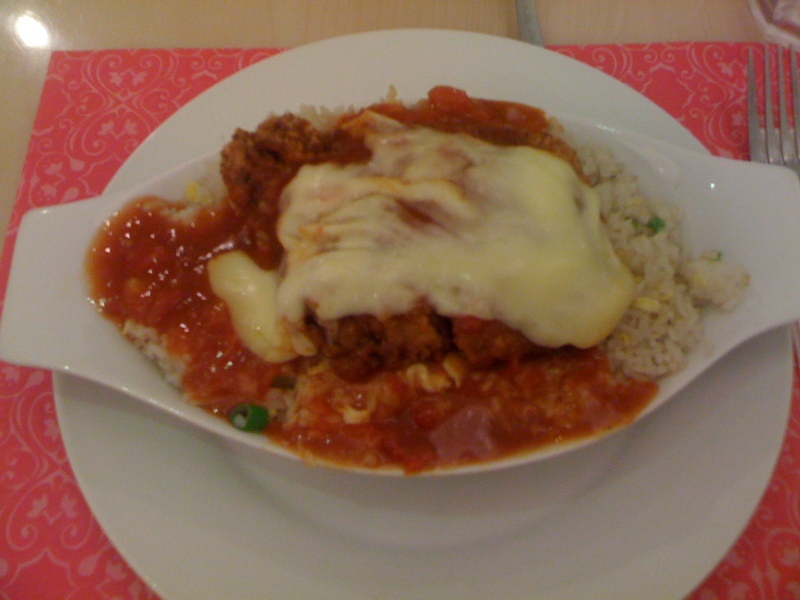 This is fried rice topped with baked breaded pork chop, cheese and tomato sauce. The porkchop was crunchy and fried to perfection. I loved the tomato sauce and cheese combination. This can be shared by two persons as they have generous serving of this. In the end, we were too full to order dessert but of course, dining here wouldn’t be complete without paying the dessert window a visit. I like the pink and green chairs. Look so comfortable to sit and eat with the family. Look so nice and clean. The ambiance is very pleasant to the eyes. That will really increase my appetite. wow sa festival ba to? parang di ko ata ito nakikita.. thanks god.. may south na na pudeng puntahan di lang puro north ang nababasa ko. anyway back on the post.. i like the ambiance,,, pambata yung dating… pude to sa mga pamangkin ko. medyo may kamahal lang ng kaunti pero sa tingin ko ok na rin base sa mga picture nakita ko kaso lang ang unto ng dessert nila.. more on dessert pa naman ako..
hmm… don’t you think it’s kinda pricey? anyway, looks like it’s worth it naman. and i like the ambiance, cute! hmm this is very interesting. I ll try to check out this establishment when I get near alabang. The last time I was at Jack’s Loft was when I had Strawberry Margarita’s with friends. And all along I thought it was just a bar of some sort. Also, my s.o. and I recently saw another Jack’s Loft in ETON Centris Walk. If only I paid them a visit, we would have eaten there instead of this pizza place right beside it. 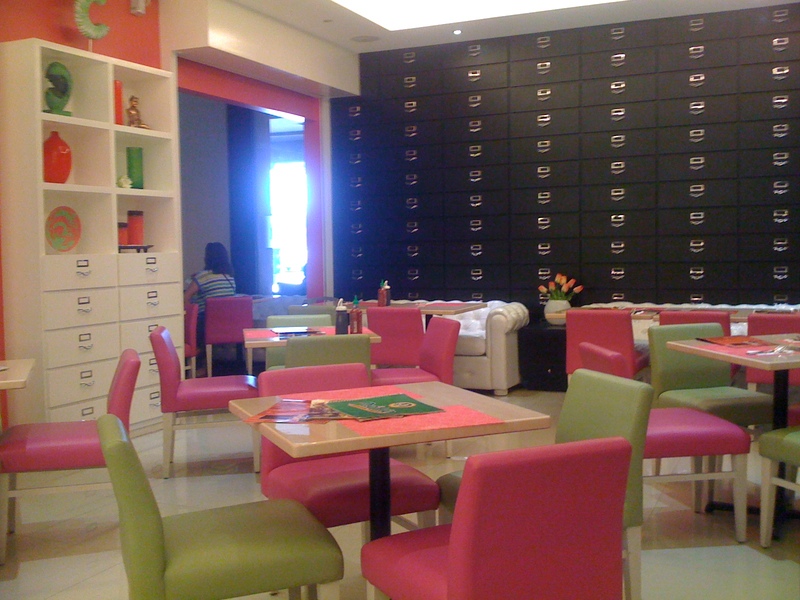 What a colorful eating area! It would certainly tempt me to sit down for a bite! Never been there. Kuripot kasi ako. Hahaha! But there are times that I used to crave on pricey foods. The place looks so playful! Food looks yummy too! I think there’s also Jack’s Loft in Gateway Cubao. when I first saw it, I thought it’s really unique and cool. It’s just that the color is too feminine for guys to actually choose that among others? Just a thought. Some of my friends love Jack’s Loft. I’ve eaten at Jack’s Loft only once, years ago, somewhere in QC, but I didn’t like it much. I always the tomato cream pasta/spaghetti and the new york cheesecake. 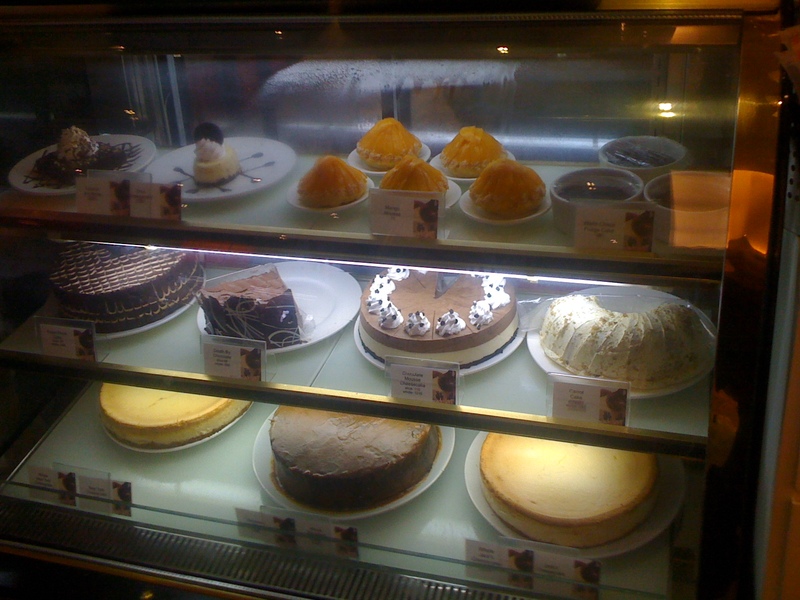 i think they have one of the best NY cheesecakes around. 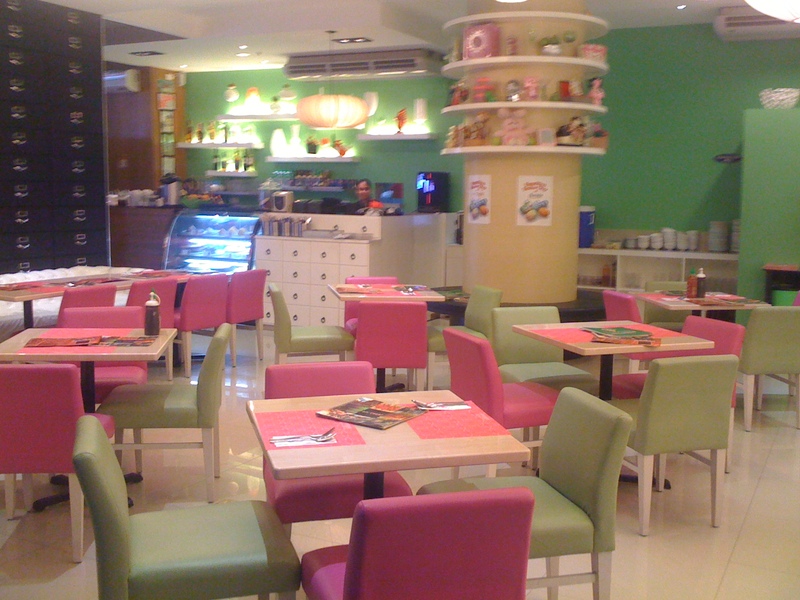 Pink and green chairs is such a nice combination.Very feminine and attractive for visitors. Love their cheesecake! We always take time to visit them when we are at Festival. eyes. Looks fresh and well-organized. It’s too inviting for a dining experience. anything fully, but this post provides good understanding yet. You’ve done a formidable task and our entire neighborhood might be grateful to you. Thanks for sharing facts and am looking for more such blogs. Honest work and keep writing. Great post. Look so nice and clean. The ambiance is very pleasant to the eyes. That will really increase my appetite. Thanks for the shearing. This is a nice post explaining a lot about jacks lost at festival mall. I really appreciate your efforts to do so. This is a nice post explaining a lot about jack loft at festival mall. I really appreciate your efforts to do so. That is such a pretty place and the food looks amazing. It’s approaching winter here and some good pho sounds amazing. Thanks for the post!